I received 3 items. 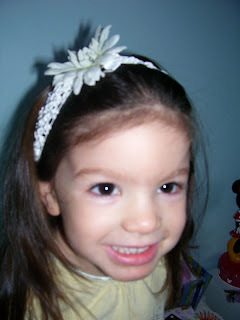 A Jewel Flower Headband, a Mix & Match Headband and an extra hair clip for the Mix and Match Headband. 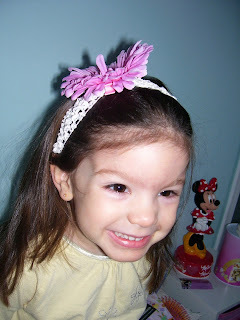 My favourite feature in the interchangeable hair accessories you can but to go on the Mix & Match Headbands. 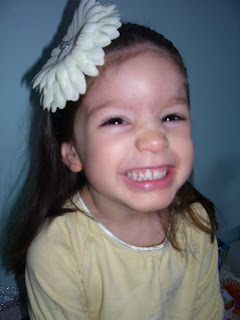 They are on alligator style clip so its easy to change them to coordinate with your child’s wardrobe. I love the way the headbands are tight enough to stay on without slipping off. Sadie wore hers around all morning and it stayed on her head. The flowers are a nice pop to the headband but are elegant and simple as well. The flower headbands retail for $17 and the Mix and Match Headbands retail for $15 with the extra clips ranging from $6-8. Check them out at www.faBOWlous.com.